The path towards the opening of the huge ACC (Asian Culture Complex), located in the heart of the city of Gwangju, South Korea, is quickly approaching its culmination and the inaugural date of this new cultural complex is set for September 2015. This article would like to engender a brief reflection – developed through both a critical analysis and the practical experience of participating in the ACIA 2014 Study Program in Gwangju last November – aimed at exploring suggestions and ideas for further discussion. Since 1995, the year of the first Gwangju Biennale, this South Jeolla province city has been exposed to the global circuit of contemporary art. The “biennalisation of art” has created a new transitory and ephemeral map, endowing several cities around the world with a “few weeks of fame”, essentially spread amongst the global art community. Amidst many more or less successful cases, Gwangju has not only been able to provide continuity to its Biennale, but also to question the need for a more permanent and local solution regarding art and culture for both the city and its citizens. Twenty years after the beginning of this process, placing art and culture at the centre of the debate, the opening of the ACC provides a valuable opportunity to reflect on the relationship between local and global, as well as on the numerous needs and possible contradictions intrinsic to the establishment of a new cultural institution. 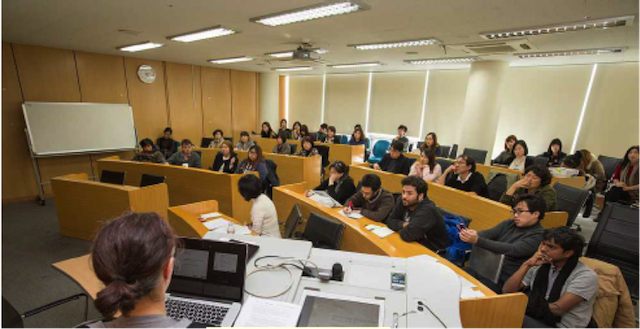 The international Artist and Curator study program organized by the ACIA (Asian Culture Information Agency) and coordinated by Claudia Pestana, brought approximately 15 from various countries (Bahrain; Canada; China; India; Indonesia; Japan; Korea, Singapore; Spain/Italy) to Gwangju, between 12 -28 November, 2014. The gathering of different professionals, mainly artists, but also curators and researchers, was focused on analysing three main questions as well as on developing an open and shared learning process. 1. What can artists and curators learn from spending time together? 2. What issues and questions can be derived today from referencing a project like Under Construction: New Dimensions of Asian Art, which took place from 2000-2003? 3. How can ACIA and ACC better understand the landscape into which they aim to become integrated and both learn from and productively contribute to it? Basically, these questions triggered the analysis of three essential issues, central to understanding the role, the function and the responsibility of the new ACC. Through spending time together, through sharing, we can create a collaborative knowledge and a new model of learning practice – driven by mobility, exchange and dialogue – that could also serve as an example for institutions. In this sense, it is important to create an open and shared space of debate and discussions, an elastic, intercultural and interdisciplinary model, which could be useful to dealing with diversity. This second issue is important for understanding the notion of “Asia” as permanently under construction and that answers to the question “What is Asia?” change according to space, time and subjectivities. Quoting Park Chan-Young: “In Asia there is an abundance of unexpected relationships among different localities that move beyond Asia”; or “Asia is neither the opposite of the West nor an object that can be concisely defined”. The use of other terms and concepts like Inter-Asia or Asias, could help in understanding the plurality and complexity of geographical and cultural definitions, especially in relation to the new ACC, which describes itself as the “Asian” Culture Complex. Another central issue is related to exploring the notion of “History and Identity”, understanding this not as a linear, but rather, a multi-layered issue. From this perspective, it is important to take into consideration both tradition and modernity, seeing them not only in opposition, but also in “untimely collaboration”. Another fundamental point for a project with such an important and transversal dimension is the question of language and translation. This last question requires a consideration of the significance of learning about the local through the experience and collaboration with outsiders and insiders, with different and opposite perceptions. The ACC, the agencies that will form the complex, the creative community and the outsiders that will look at this new landscape need to analyse and take into account the dualism (and everything is in-between and beyond) between terms such as Local/Global; Micro/Macro; Personal/Common; Individual/Collective; Public/Private. Other points worthy of exploring are the different and alternative educational models and learning practices. The new cultural institution should address and contribute to the educational field. The enormous ACC project could easily be analysed and criticized as an excessive investment. For this reason, it is important to create a critical discourse around it, starting now and leading to its opening in September 2015. It is essential to highlight that a project of this dimension requires the contribution of the entire society in order to better understand its needs, along with that of the artistic and cultural communities at both the local and international level. In terms of cultural and geographical definitions, it is worth considering not only one Asia, but multiple Asias which can help deconstruct fixed terms and geographies in order to enrich and enhance the diversity of the world, rather than creating dual confrontations between imaginary antagonists. In terms of its role and responsibility, how can an institution be both attentive and caring of its close environment, as well as a rhizomatic, open and elastic structure able to understand and dialogue with the new creative, nomadic, always “in transit” and “in-between” community that crosses geographies and cultures? How can such a project be sustainable? Beyond its architectonic power and composition, beyond the future activities of the five different areas/agencies that will constitute the complex, and beyond the spirit, the symbol and the memory of the May 18th Democratic Uprising – all elements that should certainly be taken into account and discussed in future analyses – the hope is that the ACC will not become a gigantic structure with limited visions; that it will not be an empty container, but a sustainable resource for culture and art, able to address human relationships and become an active Agora for fertile creations, debates and discussions within Asias and beyond. Quotes from personal notes taken during a meeting with Park Chan-Young. Gwangju, November 25, 2015. Concept elaborated by the artist Jalal Toufic, and mentioned in this context by the curator and researcher David Teh. Personal notes taken during a meeting with David Teh. Gwangju, November 17-18, 2015.